It’s a pretty powerful thing to know that you are loved. I’ve been fortunate throughout my entire life that I’ve always felt appreciated and cherished. As a child, my parents lavished attention on me, whether it was to praise my accomplishments as I learned to cart-wheel and read, or to curb my insurrections, then as student they encouraged me in my classes, rewarded my grades or pushed me to bring up that B. My grandmother sat through every horse show and band recital. Aunt Connie and Uncle Michael attended every birthday party and helped me with tricky musical passages. Martha, Jennifer, Alanna, Cassie, Megan all shared notes and kept my confidence through the tricky years of middle and highschool. Joy endured my company on church trips, and drove my weak momentum through shopping trips. Then Brinn entered my life and showered me with the attention I’d come to expect from all the loved ones in my life. I’ve never known a time that I didn’t have friends or family to turn to not just when times were stressful, but to share my delights as well. I wish for Ian to know this love as well. Self esteem has never been an issue for me, well, Momma and Grandma might argue with that and try to persuade you that my self-esteem is a huge problem for everyone around me, but I have never lacked in confidence. Having a strong support system helps build strong confidence, and I want Ian to never experience self-doubt or lack of self-worth, as I so often encounter with some friends or students. With that said, I do hope that he learns humility at an early age to temper his self-worth. At this point, Ian already has an impressive support system in place to convince him that he is the most fabulous person on the planet today. 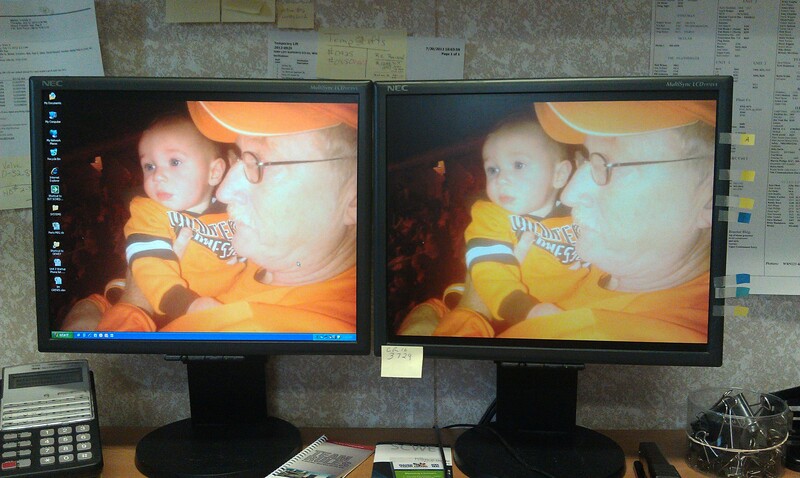 His grandpa has his image set as his desktop background at work so that all coworkers will know who is number one with this proud grandpa. Chaco’s even jumped on the Ian fan club bandwagon. 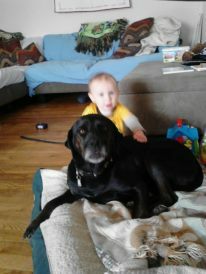 Normally she is the sweetest, kindest dog to anyone she meets. To date, she’s never met a stranger. Anyone is fair game for her strong demands of belly rubs and back scratching. Last week, however, she growled at a K-mart employee who opened the backdoor of the jeep while Ian was sitting next to her. Don’t try to mess with her baby! While there’s no need to state the obvious, I’ll do it anyway. Ian absolutely holds center court for his parents. He says jump and Brinn and I ask how high. We’re going to have to eventually not give in to his every demand, but right now his demands are so simple. His most significant demand is order us to play! Not one waking passes that this little boy doesn’t want to spend exploring and playing. 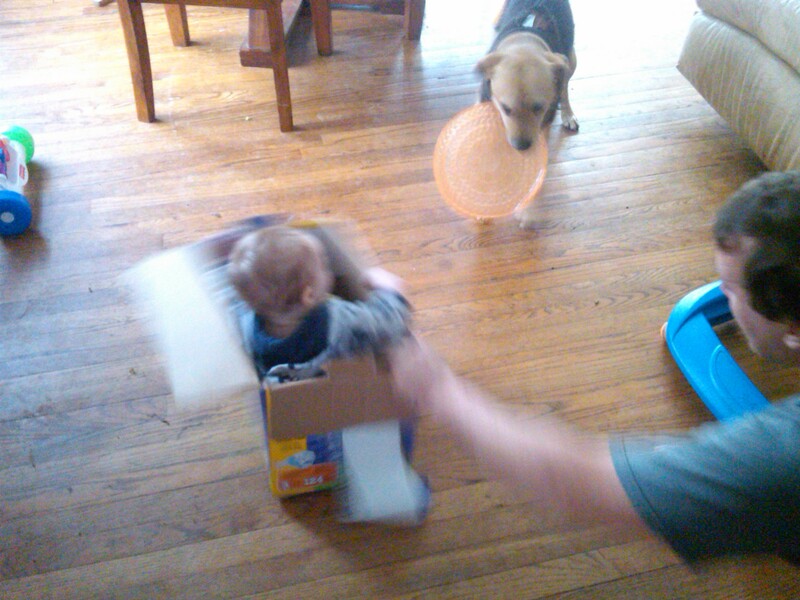 After a recent grocery shopping trip, I emptied a box of new diapers into the changing cart in his room, and Brinn decided to put the now empty box to good use and turned it into a rally racing car. What did this involve? Just some daddy-power and sound effects. Brinn pushed Ian all around the living room (my hardwood floors were already fubarred anyway) with some hair pin turns and screeching halts followed by exhilarating take offs. This attention delighted Ian to no end, and his giggling soon caught Mogwai’s attention who jumped in on the action and began zooming around the living room with them. His barking and darting had Ian screaming and shrieking with delight. 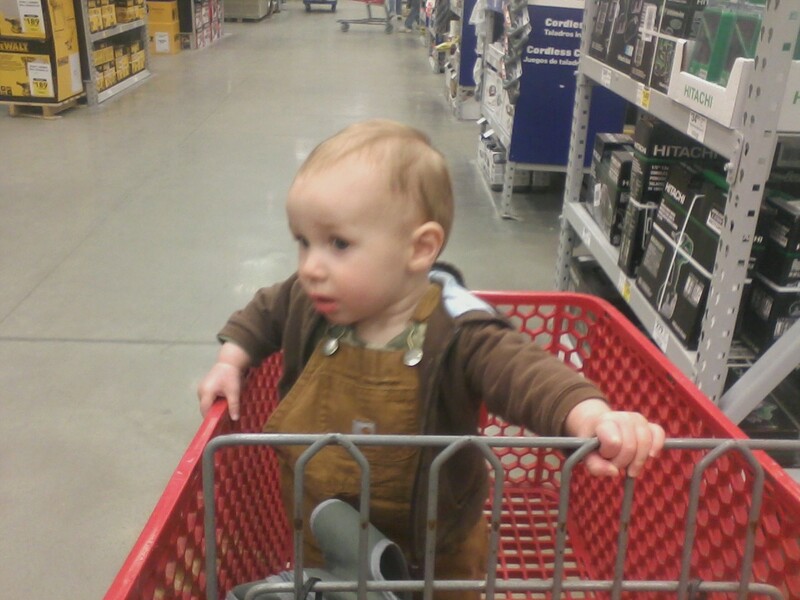 Even a simple trip to Lowe’s is a source of fun for Ian, so long as he’s allowed to make the most of his time spent there. He can’t be bothered by a clingy parent carrying him through the store, and sitting in the front of the cart is only acceptable if he needs a chow break. 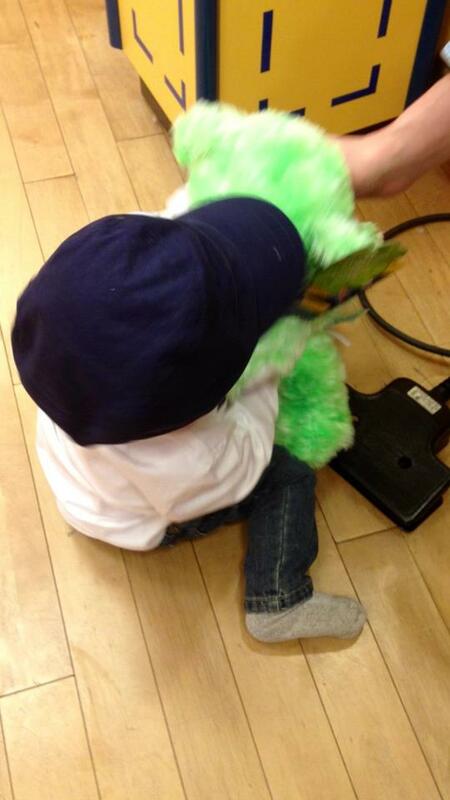 Otherwise this toddler in training needs to be standing in the cart gaining his sea-legs. So far Ian has refrained from throwing any purchase items out of the cart. 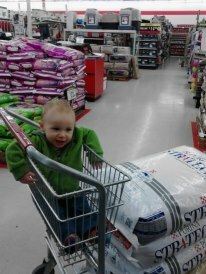 The carts for grain at Tractor Supply Company present a different sort of challenge for Ian to master, but he will not be daunted. If Mommy’s horses need Strategy, then Ian will find a way to enjoy the process of Daddy acquiring the Strategy. If only Bear and Ghosty could appreciate all the work the goes into their dinner… Ian loves going on these trips as he knows that he will receive lavish amounts of attention from TSC’s manager, Angie, and other shoppers in the store. His self-esteem is developing quite nicely. Aunt Joy has Ian convinced that trips with her are 100% about him and his fun. She’s already taken him to the Build A Bear place at the mall to create his own bear. She laughed about how at only 9 months old, he was determined to take part in the creation process, and figured out how to mash levers with his knees to help stuff his Bear. All of these wonderful experiences are not only teaching Ian to value his self-worth, but to become resourceful as well. Everyone he spends time with gives so much of themselves that he continues to experience so many different approaches to simple every day processes. I can’t possibly express the gratitude I feel towards all the amazing people involved in Ian’s life who are helping to shape him into the wonderful man he will become. This entry was posted in Family, Friends, Ian. Bookmark the permalink.